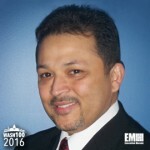 Executive Mosaic is honored to introduce Orlando Figueredo, vice president and segment leader for the consulting and intelligence community unit at Hewlett Packard Enterprise, as an inductee into the 2016 edition of the Wash100 — Executive Mosaic’s annual selection of influential leaders in the government contracting arena. He joined predecessor Hewlett-Packard in July 2001 and is currently responsible for consulting and intelligence business performance, service delivery and growth strategies within HPE’s U.S. public sector region. The original HP completed its division in November 2015 two separate publicly-traded companies — HPE and HP Inc. — with HPE as the company that houses much of the predecessor company’s federal government work. Figueredo started his career with the original HP as a technology consultant before he took various sales, management and operations roles to support the firm’s consulting offerings in the cloud computing, data center transformation and green information technology areas. Prior to HP, he spent 22 years at the U.S. Air Force, a career that included time as a communications officer in the military branch and as chief of information services at the Air Force Special Operations School. He was also assigned to leadership positions at the National Security Council prior to his retirement from the military in 2001. Executive Mosaic congratulates Orlando Figueredo and the entire Hewlett-Packard Enterprise team for their selection to receive this award.